I cleared the desk of a variety of stuff this week. Nothing really ties all these together except that they'd all been sitting half finished for way too long. 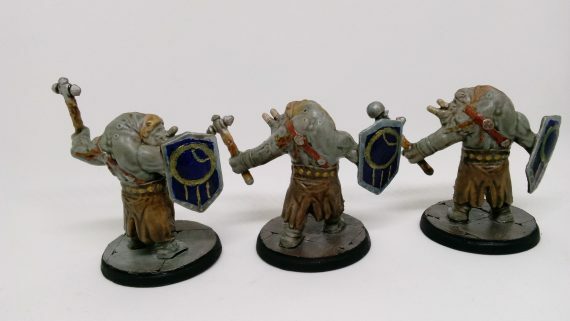 First off, here's a trio of Rhino Men. 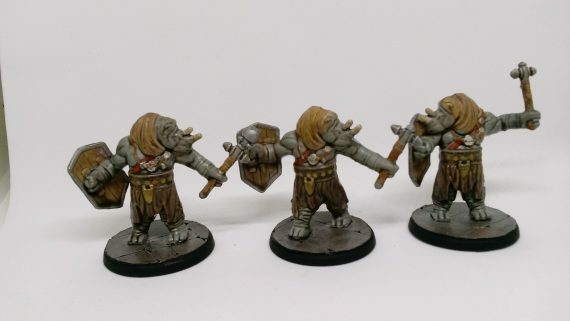 Specifically, these are "Rhox" from the "Magic The Gathering: Arena Of The Planeswalkers" base game. MtG:AoP is a rather good re implementation of the Heroscape rules with the addition of Spell Cards. Unfortunately, it doesn't seem to use or include nearly as much of the neat hex terrain as Heroscape did, but I've been buying up used Heroscape terrain. Look for a future game report with my son and I when we have more games under our belt. Not bad for game pieces! 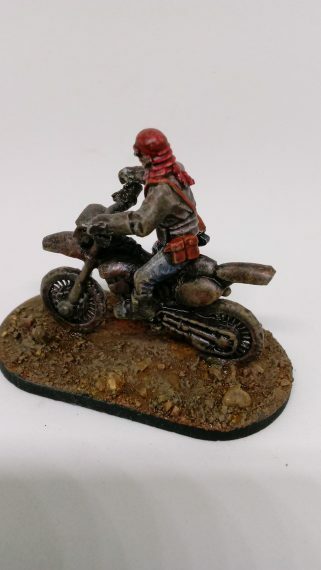 Here's the Wreck-Age Biker I painted up at the Adepticon 2017 Paint and Race. I did a passable quick-job mostly of washes at Adepticon, but a bit of touching up, a dip and some ballast and the result is much better. I've got another of these guys I hope to paint up someday. A pair of Reaper CAV's from Paint-and-Take's at Adepticon and the Chicago MIniatures Expo. 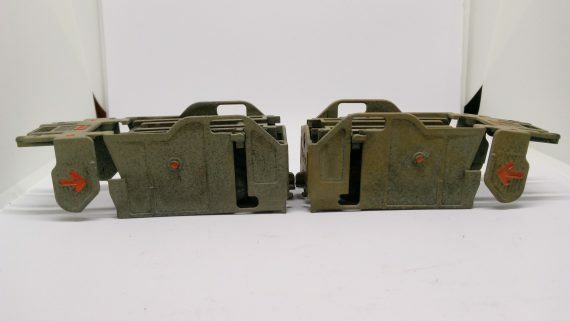 Both have visible mold lines as there wasn't any way to remove them at the paint and takes. 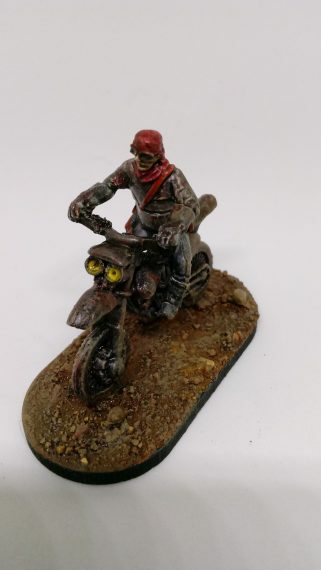 Like the biker, these guys got a bit of touching up and a dip. Interestingly the fellow with the missile pod arms had two of the same arm. I painted him up anyway. 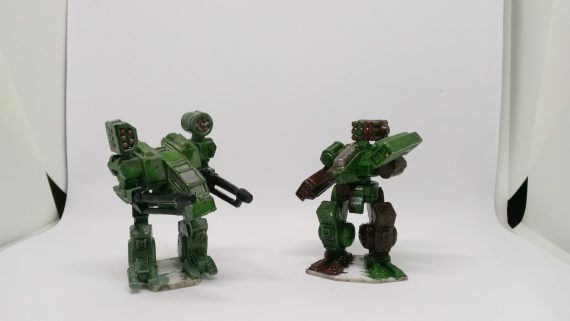 These will be based and included as light Mech's in my 10mm Liao army of rebased Mechwarrior clix. These are the new Bones PVC versions. They're quite affordable and I may buy some more in the future, though I've got some of the even nicer metal originals in need of paint already. 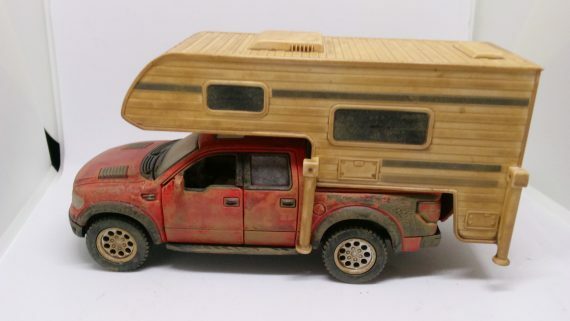 Here's a 1/48 die-cast camper that Josh gave me. The original paint was quite nice so I mostly left it as is. 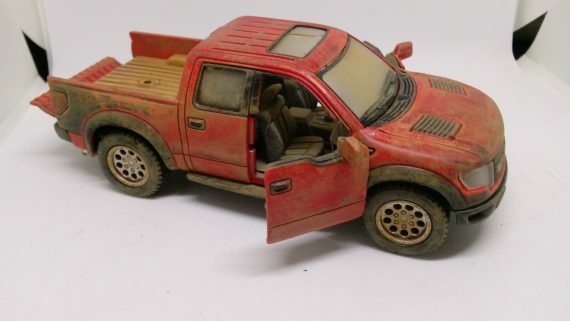 I disassembled the F150 Raptor to repaint the interior parts and touch up the front grill which was plain black. Everything except for the windows and interior got a nice even coat of Minwax Polyshades Antique Walnut. Polyshades provides a nice grime that covers everything but still pools and collects in the right places. 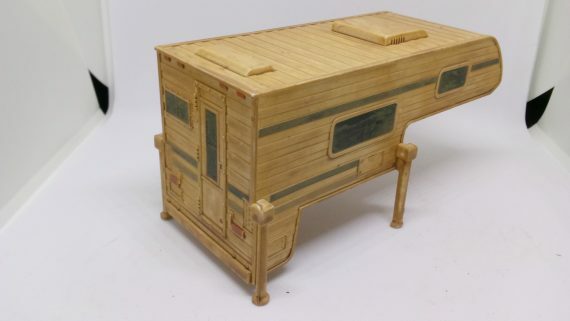 I unscrewed the camper top and clipped off the connecting posts. 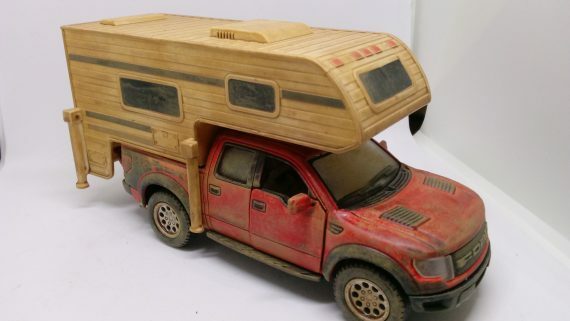 The Camper top is a pretty nice terrain piece on it's own. It still holds together nicely by the legs. I finished up with a matte varnish spray, and a tan drybrush. 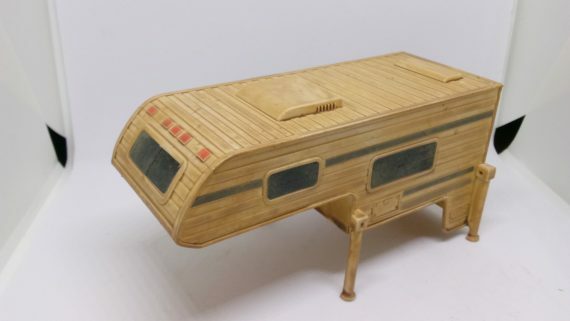 It's a nice dingy abandoned (though not destroyed) camper. Terrence gave me a handful of interesting boxes that formerly held staples for industrial binding machines. They have an opening door at one end and a movable top that I glued in the uppermost position. 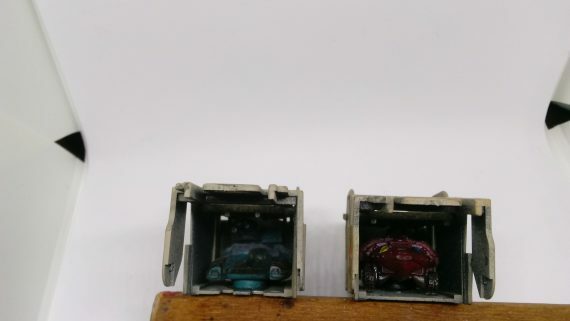 I glued an extra mechwarrior vehicle in each. 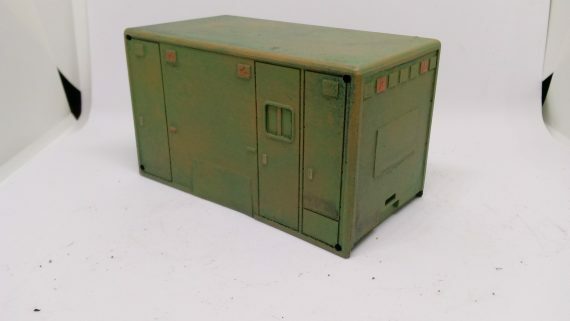 to make 10mm sci-fi cargo pods. I had too many ambulances so I turned the back of one into a sort of cargo container. 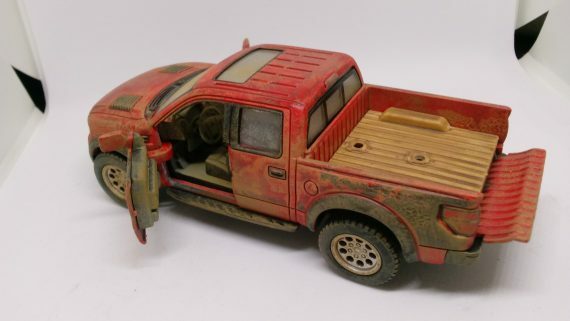 I glued blister plastic over the wheel-wells and a couple other spots, a rolling door (corrugated card) in back and drilled holes in the corners to indicate crane connection points. 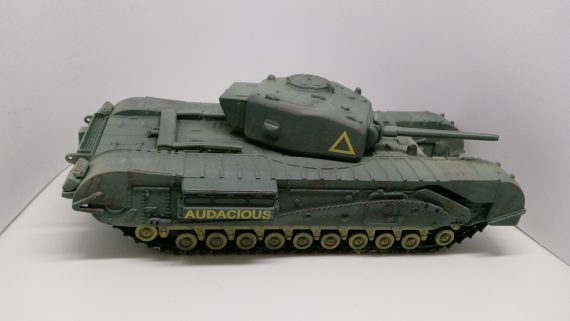 Lastly, this is not something I painted, but rather a stock 1:50 Corgi Churchill I'm glad to have just acquired. 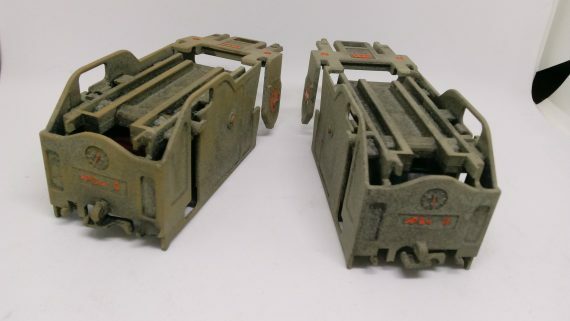 It's a nice heavy die cast toy that reminds one of a big pewter model and it already has a pretty darn good paint and marking job. 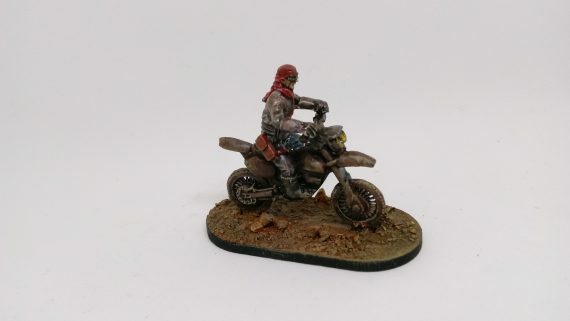 I'm going to leave the paint in-place and just weather this one up with washes and drybrushes. 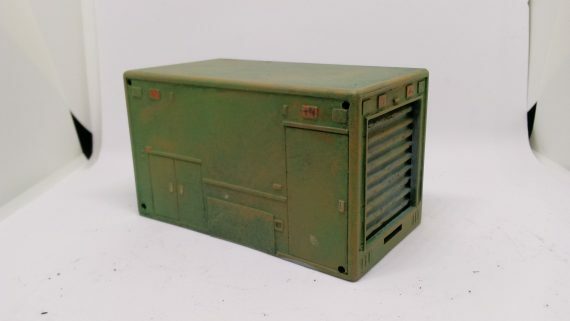 They're normally fairly expensive but I got a good deal on TMP and with shipping it was still cheaper than a warlord plastic kit. With so many projects in the works it will be great to give my Konflikt '47 British a big armor upgrade with minimal effort. And there you have it, now I'm off to fill up my desk with more projects! Wow. I suspected those empty staple cartridges could be useful. Nice to see their potential realized. Nothing is quite as cathartic as a massive workbench clean-out. Well done Karl. Lots of cool stuff that I expect will be hitting the battlefield sooner rather than later. Those cartridges are really cool. If you get any more cluttering up your workspace I’d be happy to take them off your hands! It is indeed a relief. Hopefully at least some of these will find their way to the table soon.